Verb charts?! In a CI classroom?! Is that even allowed?! I love my Little Darlings too much to abandon the verb charts. In Spanish 1, my kiddos are fearless- they aren’t afraid to make mistakes, they communicate confidently and imperfectly! They’re not burdened by grammar rules or affective filters…they just go for it! But sometimes my kiddos leave our Happy Little Spanish World and move to other Not So Happy Spanish Worlds where their success is measured by their conjugation abilities and accuracy. And that is why I feel like I owe it to my Little Darlings to teach them how to conjugate stinkin’ verbs. And even if my kiddos stay at my school and have four years of Happy CI Spanish, they’ll hopefully keep studying Spanish and likely find themselves in a Spanish class in college where their professor will expect them to understand and be able to use verb charts. So, for them too, I owe it to them. It is our job to load up our darlings with Comprehensible Input and it’s our job to prepare our students for what they will encounter next. So, how do we do both? I don’t know the right answer, but I’ll tell you my answer. In Spanish 1, starting on day 1, they get TONS of CI- language they understand. Generally we introduce a verb in the 3rd person singular form by writing it on the board in the target language and English. We start with the 3rd person since it’s an easy building block to start with and add to (rather than an infinitive, which isn’t as accessible, with those pesky stem changers, and all!). But as soon as we start talking to students, since we use language naturally, we’re going to start conjugating those 3rd person verbs! ALL YEAR LONG we use the different verb ending, always tying them to MEANING, so they can UNDERSTAND what they are hearing and reading. 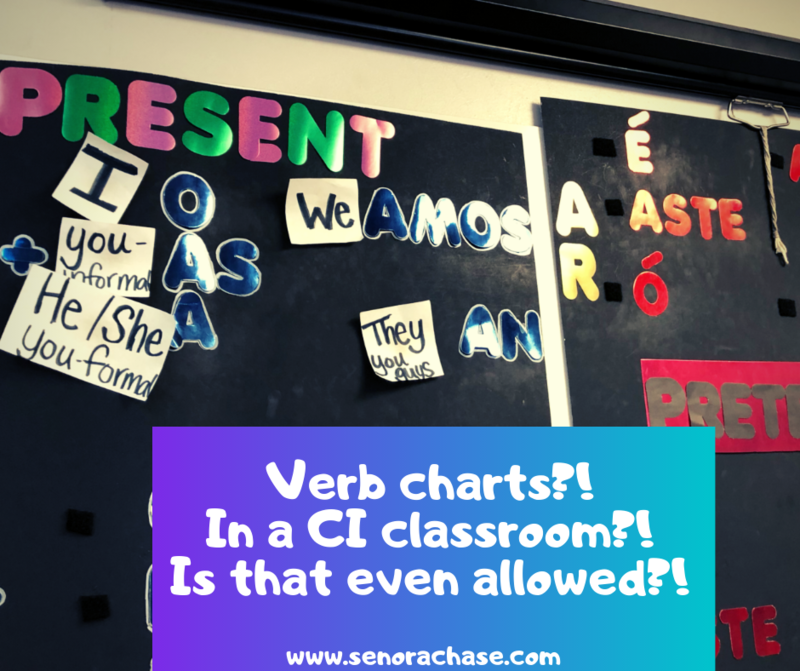 Still they have not been “taught” the verb charts…we’re laying the groundwork! They’re figuring out that the different letters on the back of the verbs changes the when and who. So when finally, in the Spring, when we have “The Talk” (the Verb Chart Talk!) it’s not scary or stressful. They’ve already got it figured out in their heads so the chart is just a tool to organize what they already know. You know how when we add an “s” to the back of a verb, like the verb “hablas”? What does that “s” tell us? And as they say “You talk!” ( I pull out a little card that has “YOU” written on it (with Velcro on the back) and attach it to the “AS” ending of the present chart. And we build the chart that way until each ending has a corresponding English pronoun. Well, that’s what I do. A lot of front loading all year long, then teach the grammar charts to organize the info they already know. Oh, and there’s one more thing I wanted to show you that I’m super excited about: Look at this!! I ordered these Cloud Light Filters to cover my horrid fluorescent lights in my classroom. They totally change the feel of my room, the light is softer, and it feels like a summer day. They’re awfully pricey though, so I only bought two to start (As you lovely people buy things from my Amazon Affiliate Links and I get Amazon Credits, I’ll be ordering more light covers…OR when I convince my husband I NEED MORE for workplace safety!) If you get headaches or eye strain from your classroom lighting, check these babies out! I love them so much! Everyone needs a sunny day skylight in their classroom! OMG! This has been something I was struggling with as a new CI teacher! Teaching at the elementary level, I know that many of my students (possibly most of them) will go on to more traditional grammar-based Spanish classes in middle and high school. I don’t want them to lose all of the confidence they gain in their years with me! As a result, I have decided to teach some select grammar concepts to prepare them for the future. The vast majority of my classes are CI but every so often I throw in some grammar concept lessons! Thanks for validating this choice for me! And the verb charts with the mobile pronouns is genius! I am definitely using this next year when I have my own classroom! Right now I travel to every class in the school and teachers don’t really share board or wall space that easily, BUT next year the charts are going to go up! Thanks! your blog has been a tremendous help to me this year! “Mobil pronouns”- that’s a great way to describe them! Thanks!! Congrats on your new classroom next year, that’s so exciting! !